In a skillet, heat up oil and when hot, add the garlic and onions. Saute until softened. Crumble the ground beef into the skillet and brown. Once the beef has browned, add the tomato sauce, sugar and chili powder. Stir and allow it to simmer for 15-20 minutes. Scoop onto the dinner roll bottoms, top with the dinner roll tops and serve. Yum! My little carb-o-holic would love these! 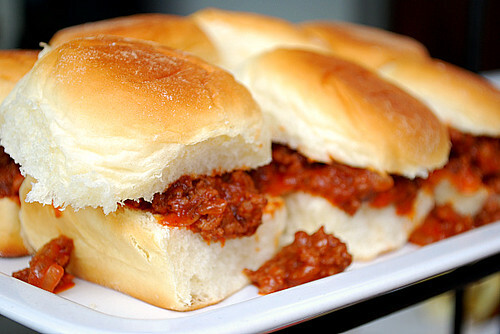 Chili sliders are my kind of fall food! My favorite soup is one I found just this past January while travelling in Vietnam Pho -- I ate it every day in all 3 cities that I visited, Saigon, Hue and Ha Noi. THis weekend my daughter treated me to a Vietnamese feast that started with -- of course, Pho. Mmm, looks great! I could eat one right now! These look perfect for football watching. I'm hungry just looking at them!